In this series Samsung still focus on multimedia. Improving users experience in all areas of entertainment features with its vivid WXGA display and 16:10 screen. Perfect for videos, playing games and reading contents in digital format. Samsung Galaxy Tab 4 has also refined its window functionality by making it multi-functional, now the users can painlessly switch from one app to another. 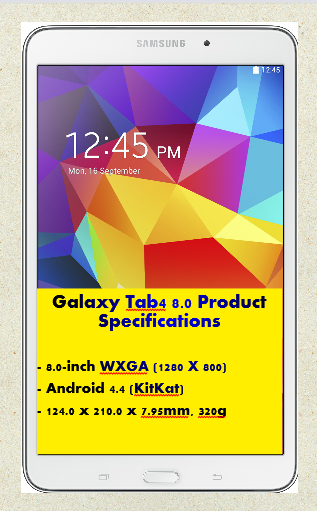 Then the drag and drop power of samsung galaxy tab 4 made users to easily manage his/her applications. Galaxy tab 4 defies age borders as it is for all ages. Additionally, it is a family-oriented gadgets allowing every member of family, even friends to share each others music, games and documents in realtime with Group Play. Plus, the Samsung link features that enable everyone to play and share data and apps in all smart devices anywhere and anytime. 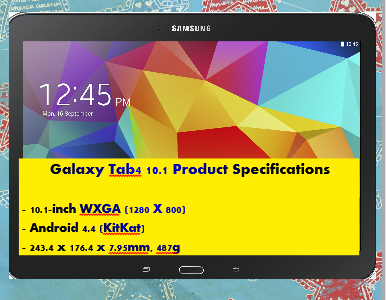 Then the last but for sure not the least is the Whatch-On, allowing users to watch their favorite TV shows on Galaxy Tab 4 series at any place, at their convenience. Samsung offered Tab 4 series in two colors, it’s black and white. The Galaxy Tab 4 is available in 7-inch, 8-inch and 10.1-inch, it is super portable. 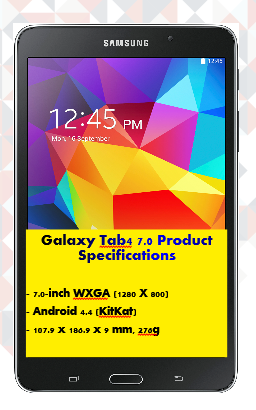 The Samsung Galaxy Tab 4 series offers a variety of features from games, multimedia, entertainment and sharing power. However, the thing that I think Samsung Galaxy Tab 4 series needs to improve is its camera. Three megapixel rare camera and 1.3 megapixel front camera is a bit low for capturing good photos, it isn’t even ideal in video capturing, if we talk about quality. The storage capacity of these Tab 4 series is big enough for that purpose. Nevertheless, it is just my opinion and aside from that I have no other requests for improvements. The processor that among of the Galaxy Tab 4 series shared is good enough, 1.2 GHz Quad Core and an Android Kitkat 4.4, it’s amazing.